Enjoy the warmer weather by strolling through Philadelphia’s historic Jewish neighborhoods. 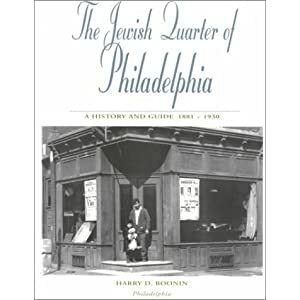 If you come from Philadelphia, chances are that you once had a close family member living in the Jewish Quarter. Take a tour of memories when South Street was the center of Jewish life in the trendy part of Philadelphia now called Society Hill. Professionally, I lead tours of Jewish Historic Philadelphia, and this is what LimmudPhilly hired me to do. As a presenter at the LimmudPhilly held in February, I felt like I learned as much as I taught. The participants were a varied group in age, gender and knowledge. Some added their experience, some simply took in each word with relish. Hired by AJC in 1995 by Murray Friedman, I am the link with “continuity of identity” that is part of the mission of this great organization. Actually my husband always says my mission is to convince people that everyone in the history of the city is Jewish. He might have a point. We started our walk at the Gershman Y at Broad and Pine Streets, and made our way to the Mikveh Israel Cemetery. It is a hidden treasure with some notable Philadelphians buried there, including Rebecca Gratz and Haym Saloman, as well as more than twenty war veterans — Revolutionary War veterans, that is. once flourished, and an old “shvitz” or two for good measure. As I get older, my religion means more to me. If we could get this feeling as children, how wonderful our future would look as a people. Limmud is helping to generate this feeling. Keep up the good work! Contact AJC 215 665-2300 for more information. Tours are by appointment. I’ve been teaching yoga for ten years, and “playing” yoga with children always returns me to the uninhibited imaginative world that unites the world of children and yoga. Sunday was a rainy day in Philadelphia. All my classes begin with sun salutations so we turned to the window that faces Broad Street and we greeted the sun: “Good afternoon sun!” I explained how yoga teaches us to connect with the natural world. “Maybe if we really focus the sun will come out!” “That would be cool,” one boy said. What holiday do we dress up and play different roles? “Purim,” they all shouted. What’s the connection between yoga and Purim? We celebrate how Persian Jews were saved from extermination through Queen Esther and her uncle Mordechai’s sechel. What better captures the yogic state of mind then dressing up in costumes to change your habitual appearance? In yoga, we wear the locust mask, the lion mask, the frog mask, as we move in and out of poses. The room was strangely quiet and parents who sat at the periphery of the circle seemed stunned in wonder at this silence with sixteen kids in the room. I often wonder what happens when creativity becomes “grown-up” after a certain age. Teaching yoga and poetry writing to children, I have found that until the age of about 12 or 13, they are spontaneous, gifted and natural yoginis and poets. I have never encountered ‘yoga block’ in a yoga-kids class. Maybe I could unite how to “play” yoga with kids with a course on how to “play” writing with adults? This is precisely the approach to a class I taught later that afternoon called “Facing the Blank Page, Facing the Yoga Mat.” When we move our bodies on the yoga mat we are taking risks and leaps of rejuvenation. When we are writing, our minds make leaps of imagination. I explained that the Jewish tradition sees the breath and speech as a privileged vehicle for creative expression. When I wrote my humor book, Yiddish Yoga: Ruthie’s Adventures in Love, Loss and the Lotus Position, I was practicing a lot of yoga. My mother, a feisty Israeli who had passed away years ago, came to me one day while I was in headstand pose: “For this you got a Ph.D. — to stand on your head?” And so my character Ruthie was born! It was through practicing yoga that this voice came to me. I am suggesting an intimate connection between yoga and writing that is well worth exploring. At Limmud, one woman shared that she had suffered from writer’s block her entire life. “I recently took a long train trip. I just know I have stories to tell inside me, but I’m blocked; they just won’t come out.” I felt her frustration in my own body. It was time to shut the lights and begin the meditation exercises. I’m moved by how brave students are in yoga and writing workshops, pushing themselves to take risks, and get out of their comfort zone. I turned on the lights and invited students to share some of their work. The woman who had expressed such frustration with writer’s block volunteered to go first. Her face was a relaxed glow. She shared a beautiful story describing a train station in clear, vivid language. I could feel her joy, as could others. She had used her writer’s block as a yoga block and found the support to tell her story. It returned me to my yoga kids, who are gifted with this spontaneous, inhibited joy of discovery. It made me want to rename tree pose, Hillel’s Pose. It seems as if Rabbi Hillel was a great yogi himself. He stood on one foot while explaining the whole of Judaism to a skeptic: “that which you don’t want done to yourself, don’t do to others. This is the whole Torah; the rest is commentary. Go study it.” Hillel was being spontaneous and playful in the face of life’s greatest questions. The Torah is called a “Tree of Life”. “Nu,” maybe the Torah is asking, “What kind of tree are you?” I’m a flexible Jewish bamboo! Author of the illustrated humor book, Yiddish Yoga: Ruthie’s Adventures in Love, Loss and the Lotus Position (Newmarket Press, 2009), Dr. Lisa Grunberger is an Assistant Professor in English at Temple University. If you are interested in her Yoga of Writing Workshop, Facing the Blank Page, Facing the Yoga Mat, you can contact her at [email protected] She is available for Yoga Kids Birthday Parties, & adult yoga classes in Philadelphia. She is also available to speak at JCCs, Hadassahs and synagogues about life as a Jewish writer, scholar of religion and literature, and her interesting background as the only daughter of an Israeli mother and a Viennese Father to whom she dedicates Yiddish Yoga. You can call: (646) 369-2350.